Megadeth continue to tease their new music. 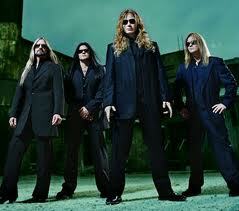 They have now expanded the online preview of the first new music from their forthcoming 15th studio album. After launching an online countdown on their official website counting down to Friday, October 2 at 1:00 p.m. EST, the band offered up an audio snippet… ,pre about Megadeth new music. Some say rock is dead. For Keith Richards, it always has been. Strange, coming from the architect of the world’s greatest rock ‘n’ roll band. “It sounds like a dull thud to me,” says the Rolling Stone. “For most bands, getting the syncopation is beyond them. It’s endless thudding away, with no bounce, no lift, no syncopation.”… more about Keith Richards new. Follow-up to Aftershock to be accompanied with 2nd cruising festival Motorhead have confirmed their 22nd album will be released in the autumn of 2015 – their 40th anniversary year. Lemmy and co have been sharing video clips and images from their Los Angeles sessions… Motorhead album in 2015.